In the fall of 2013 I joined the South Fayette School District team as an outreach coordinator to share their STEAM computational thinking model with two other schools – the Fort Cherry School District and the Manchester Academic Charter School (MACS). Since there was no grant to bring any outside resources to the MACS classrooms to start the 2014 school year, I worked with the teachers at MACS to keep STEAMing along. I joined Anne Batyko, the art teacher for MACS, and we guided 2nd graders to create a remixed greeting card for the December visit by a Middle States Evaluation team. For the past 17 years I have served as the local coordinator for the Three Rivers Educational Technology Conference (TRETC). The last six years the Pittsburgh Technology Council has managed the operational details, while I work with a regional planning team to develop all of the programming. This year the conference drew close to 500 people from Western Pennsylvania. Highlights this year included a Maker Zone and a series of featured speakers who have won state or national awards – Jana Baxter, Daniel Harold, and Zee Poerio. One of my clients, Tom Lauwers/Birdbrain Technologies, demonstrated his new Hummingbird Duo Robotics kit at the Maker Space. Justin Aglio moved from Propel Braddock Hills to the Environmental Charter School (ECS) this fall. Justin asked me to help him find resources and work with ECS. I joined Justin and his team, including Jon McGann, the founder and CEO of ECS, for a visit with Tom Vander Ark, the keynote speaker for this year’s TRETC. We observed a variety of wonderful projects including a Design Challenge in the Think Lab at ECS. I’m also working with the Ellis School, another major proponent of Human Centered Design, on professional development with a focus on Flipping the Block Schedule. For the past two years I’ve joined a team of regional educators to produce an unconference, edcampPGH. 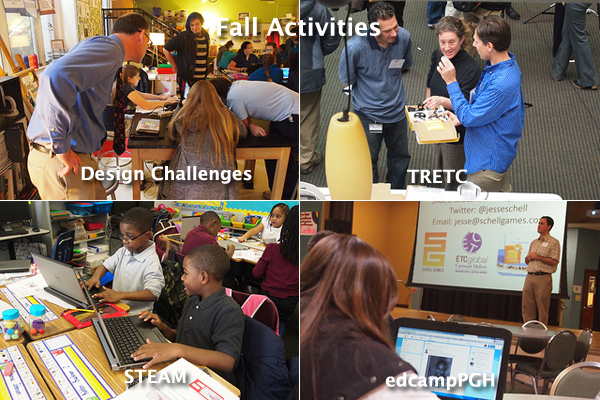 This fall edcampPGH happened at Propel Braddock Hills. Jesee Schell, the founder and CEO of Schell Games gave an Ignite talk and the fifty participants then continued the conversation on a variety of topics including game-based learning. I work with Zulama, a Pittsburgh based company. Zulama offers a game-based program for K-12 schools. I’m part of a team that develops professional development for educators learning about the Zulama Entertainment Technology Academy. This fall I wrote an article, “Core Content and the Power of Play,” for the October Zulama’s newsletter. For the article I interviewed three educators who are using a game-based approach to teaching at the elementary, middle, and high school levels.